Looking for 2 males to join our relationship panel this Saturday 2nd alongside a female panellist and our presenter. We're filming in East London from 7:30pm - 9:30pm. 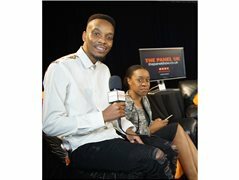 It's a relaxed conversational panel show, answering and discussing things on relationships with our presenter. We're looking for individuals who are relatable, are willing to share their stories, give insights, strategies and practical tips on relationships. All ages welcome to apply! We're looking for individuals who are relatable, are willing to share their stories, give insights, strategies and practical tips relating to the topic of "Things I Wish I Knew About Relationships". You will be required from 7:30pm till 9:30pm for filming in a studio in East London. You will be with 2 other panellists, answering and discussing the topic with our presenter. You must be available this Saturday 2nd February, from 7:30pm to film in East London.